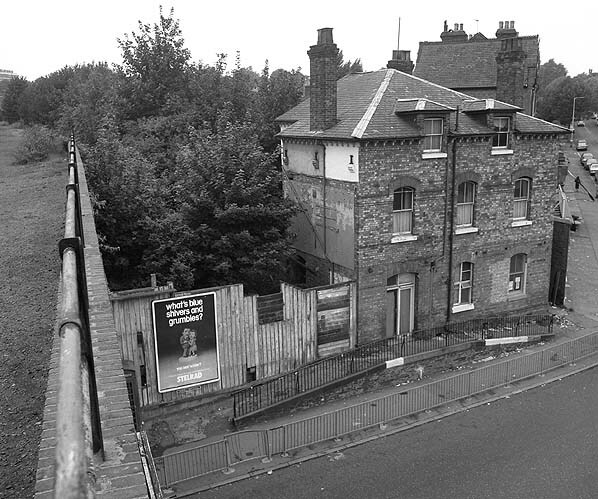 Location: The station straddled Stapleton Hall Road with the entrance on the west side of the road. Present state: The stationmaster's house survives as a community centre and information office. Notes: Stroud Green station had two wooden side platforms, partly built on viaduct taking the line across Stapleton Hall Road and partly cantilevered from the embankment. The wooden street level entrance was on the west side adjacent to the two storey stationmaster's house. The main wooden platform buildings were on the west of the viaduct with a timber waiting shelter on the opposite side, closer to the London end. If the 1935 'New Works Plan' had been completed the only change at Stroud Green would be lowering the height of the platform to a 'compromise' height to accommodate both tube and main line trains. This was done at Crouch End but not at Stroud Green. 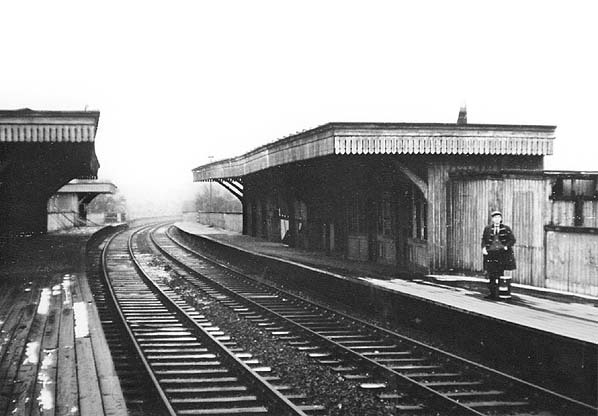 After closure the derelict station stood for for 13 years before being gutted by fire on 3rd February 1967, it was demolished shortly afterward. The front of the timber street level building survived into the 1980's. Some timber supports for the platform can still be found in the undergrowth. The Edgware, Highgate & London Railway obtained an Act in 1862 to build a line from a junction with the GNR at Seven Sisters Road (now Finsbury Park) to Edgware. The following year the Midland Railway received authority to build a line between Bedford and St. Pancras which would provide a quicker route into central London from the Mill Hill area so to improve the prospects of their Edgware line the EH & LR proposed a branch from Highgate to Muswell Hill serving the new Alexandra Palace leisure complex and an extension of the main line from Edgware to Watford. Both proposals were approved by Parliament in 1864 as was a further branch from Finchley to High Barnet in 1866. In 1866 a further act was obtained by the independent The Muswell Hill & Palace Railway to extend the branch from Muswell Hill to a terminus adjoining the Palace. The ‘main line’ between Seven Sisters Road and Edgware proved more costly than expected and shortly before completion the local company was taken over by the Great Northern who opened the line on 22nd August 1867 with intermediate stations at Crouch End, Highgate, East End Finchley, Finchley, Hendon and Mill Hill; but the extension to Watford was never built. On the 1st April 1872 the High Barnet branch was opened with the Alexandra Palace branch opening on 24th May 1873; the section between Muswell Hill and Alexandra Palace was still owned by the Muswell Hill & Palace Railway although worked by the GNR. The Alexandra Palace branch was an immediate success providing the most convenient route to the Palace from central London but the services was suspended a few weeks after opening when the palace was gutted by fire and was not reinstated until May 1875. Initially the branch was well used but within a year the MH & PR was in financial difficulty as passenger numbers fell dramatically. Several periods of closure for the terminus followed as the GNR failed to attract residential traffic to the line. Suburban growth on the main line as far as Finchley began in the 1860’s and a further station at Stroud Green was opened on 11th April 1881. Residential traffic between Muswell Hill and Highgate was also improving and an additional station at Cranley Gardens was opened in 1902 but Alexandra Palace station continued to be underused. introduced. Although the full weekday service was restored at the end of the war the branch was never to fully recover and passenger numbers at all stations between Highgate and Alexandra Palace plummeted. In 1935 the London Passenger Transport Board announced their 'New Works Plan' which included a proposal to take over the ex-GNR line between Finsbury Park and Edgware and High Barnet, including the Alexandra Palace branch. These would be incorporated into the Northern Line with a new connection with the Northern City line at Finsbury Park providing a fast and frequent service of electric trains into central London. The New Works plan was adopted and shortly before the start of WW2 the lines began to appear on underground maps. It was expected that Northern Line trains would be running into Alexandra Palace by 1940. Work on the electrification and new infrastructure started alongside the steam service which continued to operate. With the start of WW2 the service was once again reduced although work on the electrification of the Alexandra Palace branch ceased in 1940 although some work continued north of Highgate on the Edgware and High Barnet lines. London Transport had every intention of completing their New Works plan and although several lines, including the Alexandra Palace branch were shown 'under construction' on some underground maps until 1950 work never restarted. On 3rd July 1939 the existing northern line service was extended from Archway to East Finchley where it surfaced alongside the LNER line from Finsbury Park just south of the station. 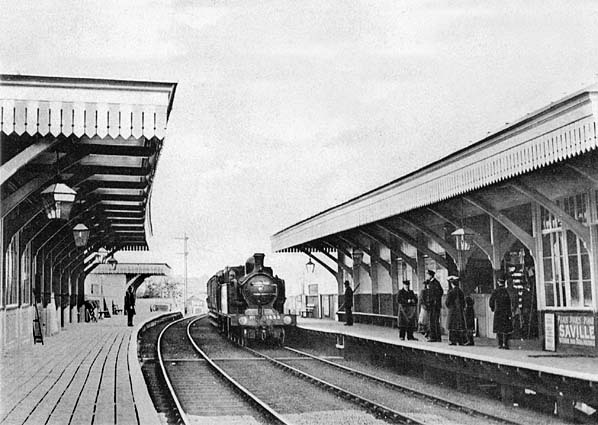 The steam trains which formerly served High Barnet and Edgware was cut back to East Finchley and after March 1941 all trains were diverted to Alexandra Palace instead but this improvement in service was short lived with all through trains were withdrawn and once again replaced by a limited shuttle. Through services to Kings Cross were reinstated after the war but were suspended to save coal between 29th October 1951 and 7th January 1952. After local pressure a peak hour only service using Victorian locomotives and ancient rolling stock was reinstated but it was clear that final closure couldn't be held off for long and closure was announced in 1953 as the number of passengers travelling on the line didn't justify its electrification. A shuttle service continued to run until the 3rd July 1954 when all stations closed to passenger traffic. Freight traffic continued to serve Muswell Hill until 14th June 1956, and Cranley Gardens until 18th May 1957 after which date the line north of Park Junction was abandoned. The conductor rails were removed between January 1954 and February 1955 and the track north of Park Junction was lifted by early 1958. The section of line between Finsbury Park and Highgate remained open to freight traffic with Highgate High Barnet and Mill Hill East remaining open until 1st October 1962 and Edgware until 1st June1964. The line was also used for a weekly transfer of tube stock between Drayton Park and Highgate Wood sidings until 29th September 1970, with trains being hauled by LT battery locomotives. This eventually ceased because of the condition of a bridge and the flyerover lover the main line north of Finsbury Park. The reaming track was lifted in January 1972. Before final closure the line had been used as an unofficial walkway. The section between Cranley Gardens and Alexandra Park including the St. James Lane viaduct was adopted as a Parkland Walk by Haringey Council in 1976 and the section between Finsbury Park and Highgate was similarly adopted a few years later. The Parkland Walk was officially opened in 1984 following extensive re-surfacing and improvements to access. 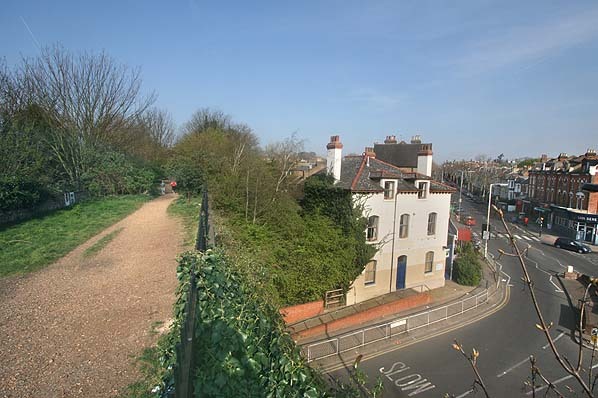 The 3.9 mile walkway and cycleway is divided into two sections Finsbury Park to Highgate and Cranley Gardens to Muswell Hill and is now London's longest nature reserve and is incorporated into the 78 mile Capital Ring. Main historical source: London Railway Record No's. 6 & 7 (January & April 1996) published by Connor & Butler. Special thanks to Ian Baker, Peter Wright, Jim Connor, Jim Blake, John Alsop, Brian Hardy, Dave Bosher and Richard Casserley and others for their photographs and Brian Halford for the tickets. Stroud Green Station looking north in April 2007, only the stationmaster's house survives.